A professionally designed and optimized loan officer website should be at the core of everything you do online. Below we will go through, in detail, what it takes to have an optimal digital foundation for everyone from a brand new LO just getting into the business to a $200 million dollar producing team of loan officers. Each of the elements in the figure below are not suggestions or pick-and-choose, they are all requirements for any loan officer that is looking to take their digital marketing seriously. Every loan officer should have their very own website. 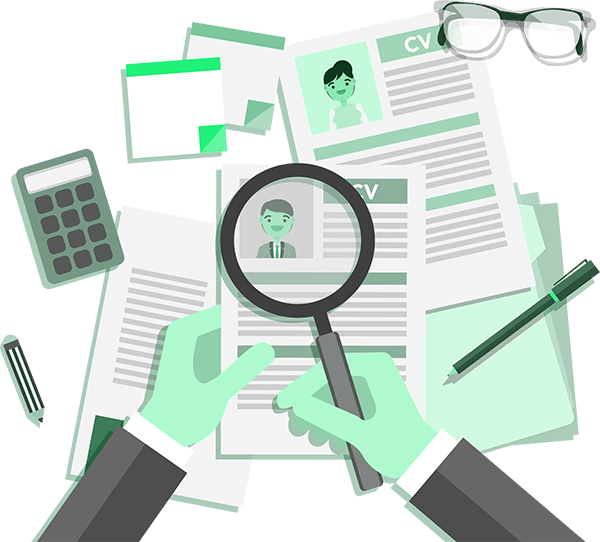 If you're like 95% of LO's out there, you have a landing page with your basic info on it that can be found by digging through your company's corporate directory. We get it, the company set this up for you, it's free and quite frankly it should be. You deserve better. Those are just a few of the many advantages and we didn't even touch on the social automation piece which engages not only your website visitors but all of your social followers on a weekly basis. Everyone likes looking good and your customers do judge books by their cover whether you care to believe it or not so always making sure you're putting your best foot forward aesthetically on every device is pivotal. Invest in yourself and your brand, it's always money well spent. Onto Local SEO. Local SEO What is Local SEO & Why is It Important? Local SEO(Search Engine Optimization) is the process of making your loan officer website rank organically(illustrated below) in Google for various terms related to both mortgage and your target geographic area(s). While every mortgage professional would love to rank for terms like "va loans" on Google, it's not a realistic scenario for 99% of individuals or teams who don't have the time, man-power and money to invest in the years and years of efforts to achieve this. However, ranking for "va loans YOURCITY" IS a realistic goal and one you should want to achieve since the visitor is both looking for relevant mortgage information as well as being located or looking to be located in your target service area. Search engines are very sophisticated robots that only know what you tell them via your website code and various offsite factors that point to your website. You are then ranked for particular phrases based off a laundry list of those characteristics. What should be obvious but suprisingly isn't with the overwhelming majority of websites out there is that if you're looking to rank for "va loans YOURCITY" just to stick with the same example from above, then you should probably have that term, variations of that term and references to the page you're wanting to rank for that term prominent on your website. By simply doing that and doing it correctly, you're already head and shoulders above the majority of your competitors. Beyond those elements there are a multitude of simple strategies that help build up your website's relevance as the process of optimzing a website for search engines organically is a marathon and not a sprint. If you hear otherwise from a perspective service provider, run. Below are just a few strategies we implement across every website we build with additional, ongoing services available and highly recommended. Meta tag optimization - These tags are what the search engines will show when your website comes up in results so making sure the title tag carries your targeted phrase(s) is crucial and the description tag should be a short summary about the info contained on the page with enticing verbiage to get the user to click-through. Meta keyword tags have 0 relevance and should be ignored and if you hear otherwise, again, run as this has been irrelevant since before 2009 and here's proof from Google. Heading Tags - On most websites these are generally the headings that are bigger, often bolder at the top of paragraphs. These headings should follow a logical order of relevance and describe the paragraph that follows it. No need to keyword stuff here since the content should support the original topic as most content does so the keyword or variation will be present organically, no need to force it. Internal Linking - If you want to see the best example of this, visit Wikipedia and search for anything. 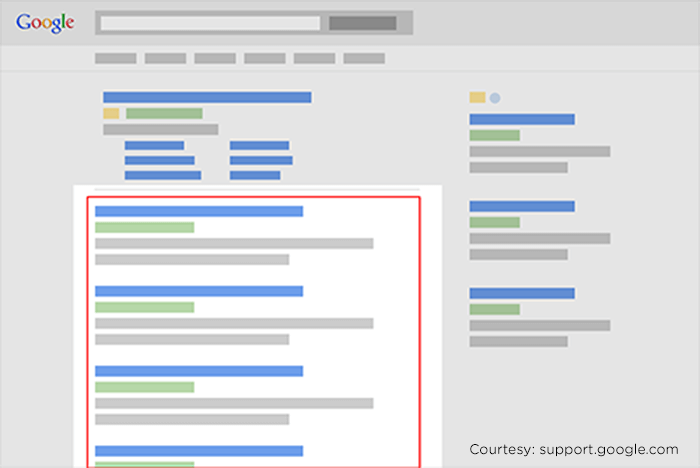 On every page you'll see a vast amount of internal links on the page, providing definitions to words, other relevant pages to the existing topic and much more. Your website should work the same way. If you're talking about a subject on one page and have another page or post with more info, link to it. Image Alt Tags - Just like page titles, tag your images with relevant descriptions. This has a positive impact on the page across the board and can even make you relevant in image searches. Post Fresh Content - Continuing to build out your organic presence over a long period of time will have the most positive effect on your website and can be done through regular content posting via your blog. Blogging helps build up the relevance of your entire website by diversifying your keyword sets through the various topics you post about, therefore making you relevant in more searches. 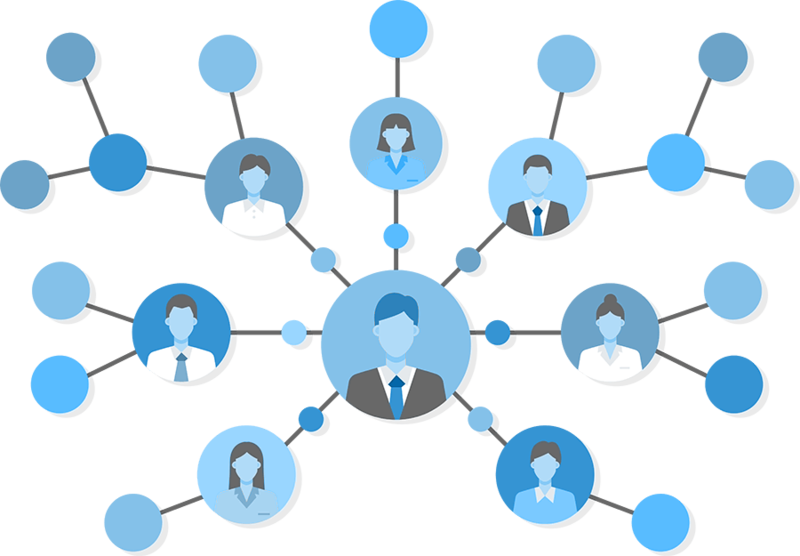 Posting regularly also helps build internal links telling search engines what pages are relevant for particular terms on your website and when done properly with quality content, you'll also garner some external links via social sharing and other avenues for your users to link to your content. There are additional SEO strategies well worth implementing but the list above will act as a good foundation for you to get off and running and start becoming relevant in local search. Next we'll jump into more detail about your website content. Content is not limited to the words on your website. It can be represented through videos, ebooks, infographics, pdfs, email marketing and more. Start by building the strategy around what you're going to publish and then deployment will be strategic and consistent. When speaking about content you're continually going to hear us mention consistency because right behind quality, consistency is the next most important element. Don't go for the big billboard on the freeway for 2 months, take the bus stop advertisement for 2 years. People need to see your brand, your message and be reminded of it constantly so that when that buying decision occurs you're top-of-mind. Everyone can tell you about that one commercial they always hear on the radio but will forget that Super Bowl ad a month after the game. Once your strategy begins to pay off and your content drives a visitor to engage with you, make sure that lead capture process is as easy as possible. You built a website to promote your mortgage services so don't make it hard for users to find a phone number, contact button or force them to do one or the other. 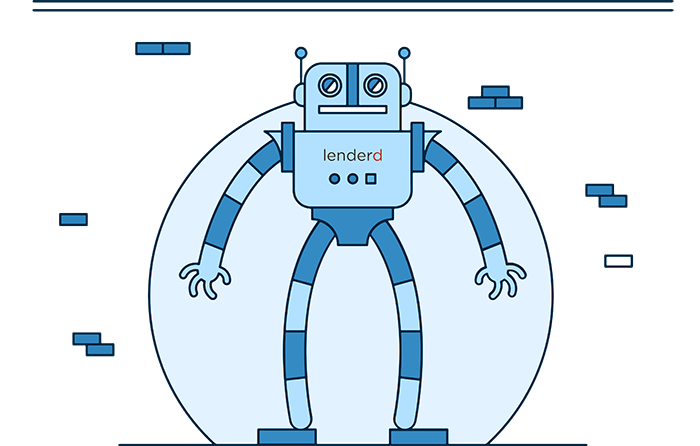 Here at Lenderd, we're a big proponent of fixed headers and/or lead capture forms or buttons always being displayed on scroll across all devices. Will a user not contact you if they really want to and your info or button isn't prominent always? Of course not but being in front of their face at all times certainly doesn't hurt your chances and at the end of the day, it's why we build loan officer websites. Very often contact forms are setup to "over-collect" information and while this may be information you will need at some point througout the loan process, we strongly encourage our customers to make the barrier for initial contact as minimal as possible. Grab a name, phone number, email address and ask how you can help, that's it. Especially in the mortgage space, you will need to engage with a client before they submit a purchase or refinance application for a home so your #1 goal is to get them on the phone or in your office to meet so you can do your job and turn them into your next referral source. Having an old phone number or even no phone number, no website or contact info on your facebook business page and even an incorrect office address can all lead to missed connections. Audit yourself and your digital properties quarterly to make sure all info is correct and readily available otherwise you're missing potential opportunities due to shear laziness which is the worst excuse in the book. Once you're fortunate enough to capture a lead from your website, where does that lead get stored for immediate and future marketing efforts? We hope you're thinking CRM and not rolodex. Leads are hard to come by and generally well-earned so make sure you maximize their revenue potential with a CRM(Customer Relationship Management) system. The only thing worse than sending a monthly newsletter is sending nothing. These days you need to get a bit more creative with your follow up messaging because newsletters and canned market update emails are going to get very little engagement if any unless you happen to have a golden list of homeowners who can't wait to hear about current mortgage rates month over month. Assuming you are collecting phone numbers during your lead capture process, which you should be, skip the emails every other month and send out a simple text notification. Your open rate will be dramatically better than email so make sure your message is short and to the point. Remember, you're not trying to sell here, you've already done that which is why they're on your list. Your goal is simply to remind them you're a loan officer, not sound pushy which results in unsubsribes, and that's it. Staying on top of your database is important as it pertains to segmenting your leads. 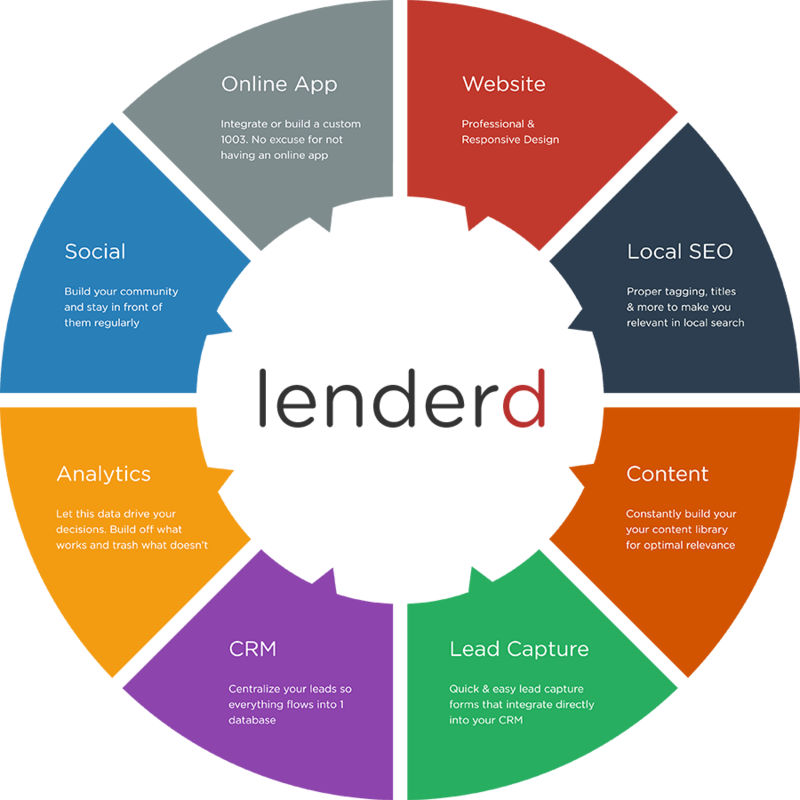 Here at Lenderd, we believe everyone in your database is a lead and there are no such things as contacts, only leads that are in a different segment or stage. If you're not treating them that way then you're missing out on potential business. Getting creative with your segments helps you stay in front of all your leads for completely different sets of reasons so you can tailor your message to drive the most engagement (ie just closed, potential buyers, refi clients, etc.). Now that your website is generating leads, it's time to identify where they're coming from, what's producing the best conversion rates and then tweak your efforts to maximize your ROI. (Hint: Website Analytics can help with that). You're not smarter than data. No matter what you think the best landing page or PPC campaign in the world is, it does not matter, listen to the data. The beauty about digital marketing vs traditional paid media or the billboard on the side of the road is you actually know what parts are working and what parts are not in real-time. Knowing the number of users that visit your website is a no-brainer but what about those visitor's behavior while they're on your website. Wouldn't it be advantageous to know how many users clicked your contact button or starting filling out your contact form and didn't finish? How about tracking outbound links so you know whether your users are clicking out and never coming back or tracking the top menu vs the bottom and see who clicks what.  Those are just a handful of things we track for our enterprise clients because when you have 100 or 1,000 websites up and running, your sample size of data becomes large enough to start truly understanding user behavior and all possible tweaks can make a real impact. Tweaking your website for increased conversions is a great way to squeeze a little more milk out of the cow and increasing your ROI rather than spending more money on a particular campaign and achieving the same results. Tweak, refine, repeat, it never ends. 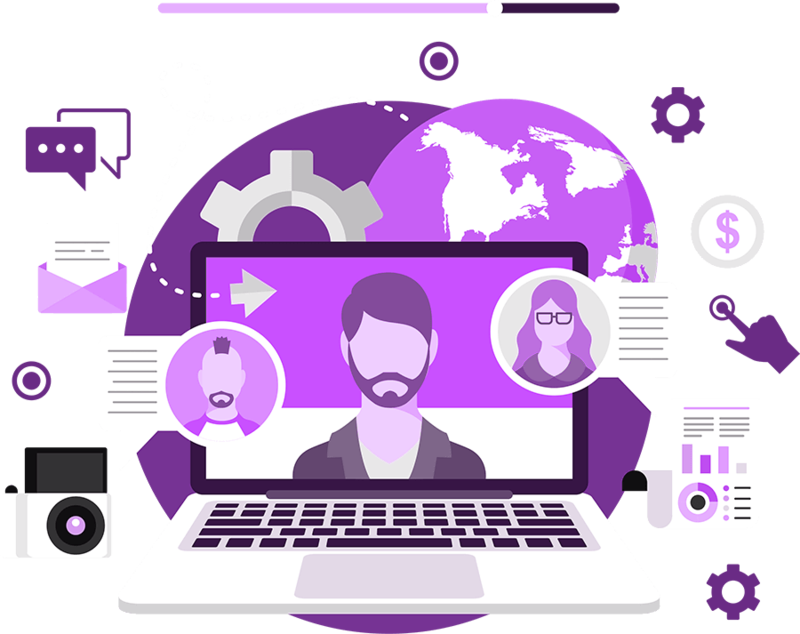 Your digital loan officer marketing foundation is almost complete, now it's time to start connecting to your external sources to automate your messaging and content deployment. Social Post Quality Content, Engage, Repeat. Look at social media marketing as your digital farm area. Instead of sending postcards like you did back in 2000, spend 1/10 of that amount and grow your likes & followers in your area. Building an audience on Facebook will prove to be valuable for your business but unlike the sales pitch you get from most social media marketing "gurus" out there, it won't be free to leverage them. Posting QUALITY content through the different platforms (Facebook, Twitter, LinkedIn & Google+) is the first step. Doing that will garner a few views and possible visits to your website but if you want to have an actual impact you'll have to spend. The good news is you won't have to spend much. A typical post can be boosted on Facebook for anywhere from $5 - $20 depending on the audience and longevity. If the fed significantly drops mortgage rates, your followers will want to know. If your company was 1 of the 300 companies recognized as the top 100 best places to work by an insignificant source, people don't care. The sad reality is that people would rather see a meme (we know this for a fact) or the latest viral video than almost anything to do with mortgage. You're in this game for eyeballs and engagement, give the audience what you think they'll like or share. They already know you do mortgages, the content is just there to remind them of that fact. Every individual and enterprise client we have opts-in to our social media auto-posting service because it makes very good sense to do so. What this service does is take every blog posted to your website and automatically posts it to the 4 major platforms listed above. This alleviates repetitive work and gets your message in front of your likes & followers with minimal effort, all while linking directly back to your website. The last and most obvious piece required for every mortgage website is the online application. If you're not providing digital applications in 2019 for your clients then digital marketing should be the least of your worries. Not much to cover when it comes to online applications. Most mortgage companies, no matter the size, have 3rd party systems that handle their applications and are generally very easy to integrate with. 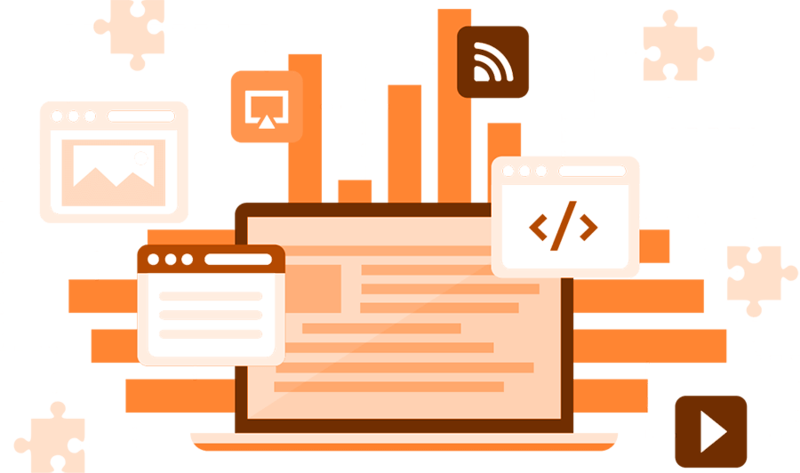 Those integrations take place by either linking off to the individual user's application page or by posting data from your loan officer website directly into a CRM or other external system that stores or syncs that data with the 3rd party software. This is on purpose as we have no intent, now or ever, to be the final resting place for your customer's sensitive financial and/or personal data. The extent of our application taking is covered above so if you're looking for an end-to-end system we are not it but can recommend some of the better ones to fit your needs and then integrate seemlessly with them. That concludes our digital loan officer marketing foundation guide. We hope you found some useful information here and know it can be a bit overwhelming so should you have any questions, don't hesitate to contact us directly and we'll be happy to help. 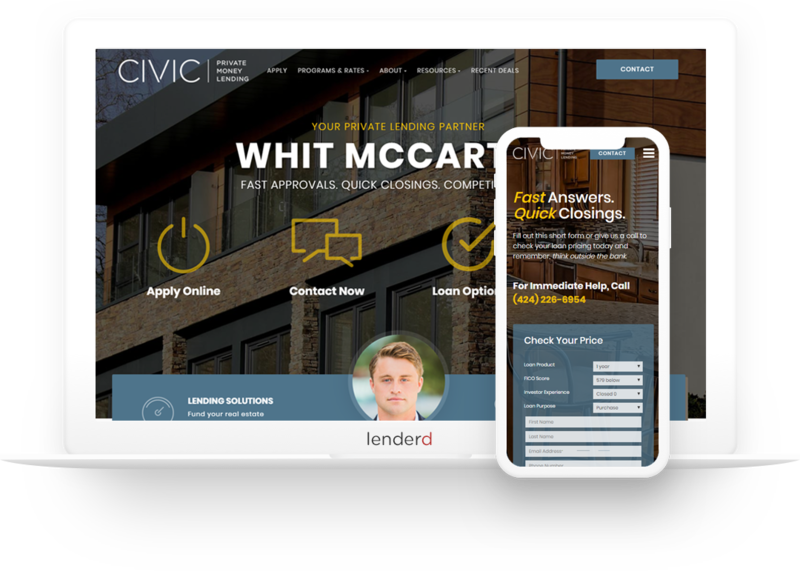 Beyond building custom, feature-rich websites for loan officers we also utilize our other real estate agent and loan officer tools that will help you grow your business. Agent Rules is a product that gives you, the loan officer, the power to build powerful, automated home value and sold alerts landing pages for your agents in less than a minute. These pages are something that most agents spend $50-$150/month to have due to data and other setup costs on top of design and other maintenance fees. Beyond saving your agents money, you're also now copied on every lead that comes through these pages giving you consistent opportunities to re-engage with your agents and also grow your refinance business via the home value leads. Agent Rules = More Agent Meetings which = More Loans. Your agents need IDX websites. Provide them with an exclusive, discounted rate on our Elite Agent offering as a lenderd member that will not only save them money, but also provide them with a professional website and social marketing automation that will without a doubt, be an upgrade from what they're currently working with.